We received an e-mail from Simon Wu who is a leader of TBLA. According to his mail, he would come to Japan for cycling with six members. He invited us to join their tour. 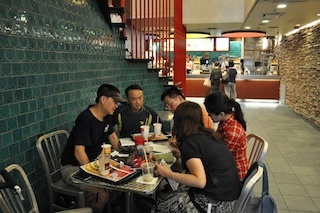 Unfortunately, we were not available to travel with them but could meet Simon and two members at McDonald's near JR Mejiro Station. 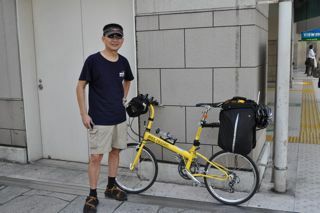 Simon appeared with his yellow folding bike. (*2) He arrived Japan few days before than other members and already traveled Nikko alone. He came back from Nikko to Tokyo at the day we met. When we had coffee at McDonald's with Simon. Michael Yu and Peter Liu came and joined us. They introduced TBLA and their activity. TBLA has around 650 registered members. They normally have an activity every Wednesday night and Sunday morning. On wednesday, they start “Night biking” from 8:00 p.m. and ride around for 1.5 hours. On Sunday morning, they meet at 7:30a.m. and ride together around 30 km including 8% hill climb. In addition to weekly activity, Simon plans a travel for cycling not only in Taiwan but to overseas. He visited Japan with 6 members for this time. 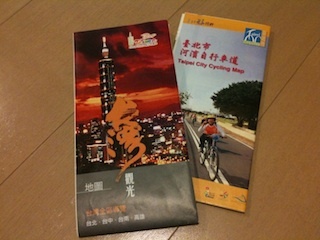 They gave us a Taipei Cycling Map and Travel Map of Taiwan. According to them, Taiwan government promotes the increased use of bicycling to resolve traffic jam and pollution issue. With this policy the government is spending more money on developing bake path.TBLA members told us that center of Taipei was still heavy traffic and difficult to ride for visitors but outside of Taipei area was nice for us. They highly recommended to ride through bike path on the East Cost. They told us they would ride together if we visit Taiwan. It was very nice time with TBLA. We hope we ride together near future. This page contains a single entry from the blog posted on October 3, 2010 11:25 PM. The previous post in this blog was The Blind Spot of Japanese Bicycle Riders. The next post in this blog is Bike to Commute.